While many went the Airbnb route for the Democratic convention, some hotel rooms remained available. Airbnb, the online marketplace where people can share their homes as short-term rentals, said demand for housing accommodations was "spiking" during both the Republican and Democratic conventions. In Cleveland, 1,900 visitors are staying at Airbnb listings this week, nearly four times more than other weeks. In the Philadelphia area, more than 5,200 people will stay in Airbnb homes, rooms, and apartments during the Democratic National Convention, about 2½ times more than usual in July. More folks will be staying in Airbnb housing here because "historically, we've had a larger host community in Philadelphia," said Airbnb spokesman Christopher McNulty. Airbnb has about 9,000 listings in the Philadelphia area, compared with 2,000 in Cleveland, which is a smaller city. About 50,000 delegates, journalists, protesters, and visitors are in Cleveland for the Republican convention. More than 50,000 are expected in Philadelphia next week for the Democratic convention. Hotels have been packed in Cleveland, and some convention attendees are staying in nearby Akron, Canton, Sandusky, and other cities in north and northeast Ohio, said Joe Savarise, the Ohio Hotel & Lodging Association executive director. General managers at Cleveland-area hotels have reported "record" bookings, not just this week but "even the week before the RNC and before the largest numbers of attendees showed up," Savarise said. 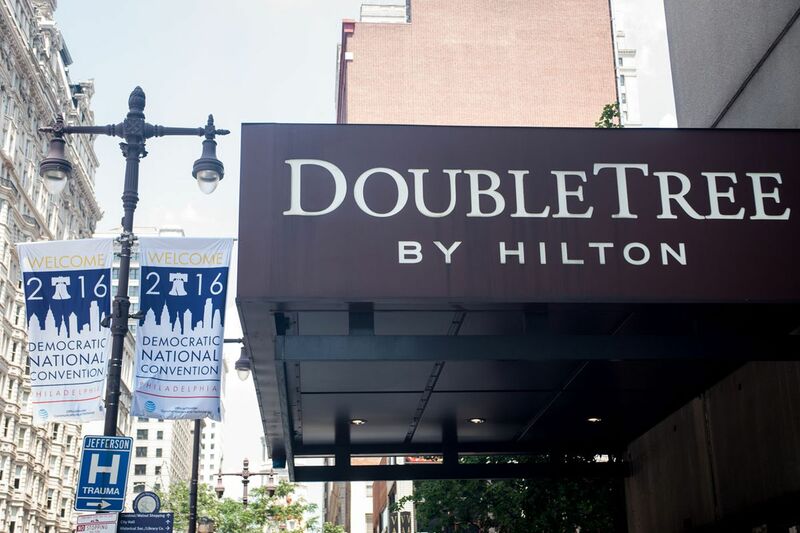 Ahead of the Democratic convention, hotels in Philadelphia are filling up, but some rooms have opened up since July 15, which was the deadline for confirming bookings, said Ed Grose, the Greater Philadelphia Hotel Association's executive director. People still looking for a hotel room can go to visitphilly.com and type in the dates, Grose said. Hotel rooms that are left in Center City are pricey - $673 and $698.50 a night on Rittenhouse Square and $729.80 at the Hyatt at the Bellevue. "That tells me they probably have fewer rooms available," Grose said. Prices vary depending on the arrival date and length of stay. Hotel occupancy numbers will not be known until the Democratic convention is over "because it's a moving target," he said. "Center City is filling up fast. I know the airport [hotels] are doing well. Valley Forge is doing well. We still have rooms available this close to the convention." Tripping.com, a search engine that aggregates rental properties from websites such as VRBO, HomeAway, and TripAdvisor - luxury condos, furnished beach houses, ski cabins, and bungalows in 150,000 destinations worldwide - said Monday that more short-term rental-home inventory remained available in Cleveland - 79 percent compared with 52 percent rental homes still available in Philadelphia during the Democratic gathering. In both cities, the political conventions boosted average prices for vacation-home rentals from $258 to $508 a night in Philadelphia and $290 to $332 a night in Cleveland, Tripping.com said. However, booking a luxury apartment or a ski chalet "does not directly translate to hotel demand, or the number of visitors at an event," said Cleveland's Savarise. "It is a very small part of the market for this."